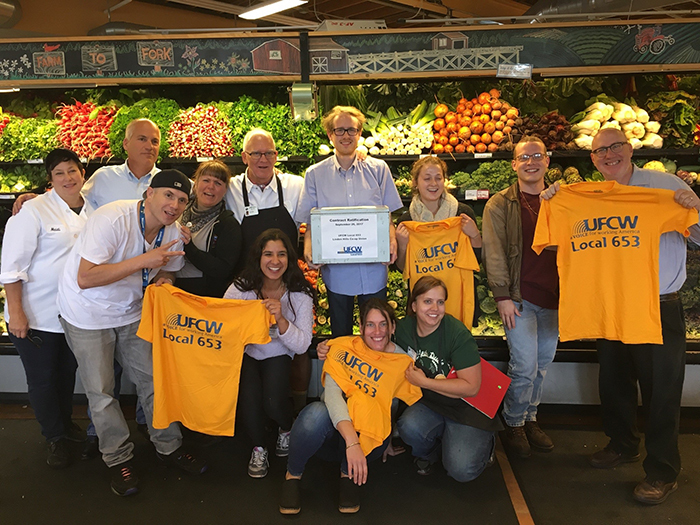 Linden Hills Co-op workers in Minneapolis, who are members of UFCW Local 653, ratified their first union contract on Sept. 26. The three-year contract, which began on October 1, includes raises for all employees and paid time off. An overwhelming majority – 85 percent – of Linden Hills Co-op workers voted to join UFCW Local 653 in February of this year. “By standing together and voting to approve this contract, we’ve improved our lives and jobs. We chose to do this because we’re committed to strengthening our co-op and community because no one deserves to be left behind or struggle alone,” said Evan Adams-Hanson, a front end floor coordinator. “What we fought for and now have is so real and important to building the better lives we’ve earned and deserve. Our amazing co-op has become even more amazing because we’ll now be able to better serve our community and take care of our families,” said Tracie Lemberg, who works in health and body care.